It's important to know the days of the week in Spanish, so you can make plans with other people, travel, and show up to places and events on the right day. Look at the chart to the left and notice how the days of the week look in Spanish compared to how they look in English. The words don't look the same at all, and notice that they're not capitalized in Spanish. 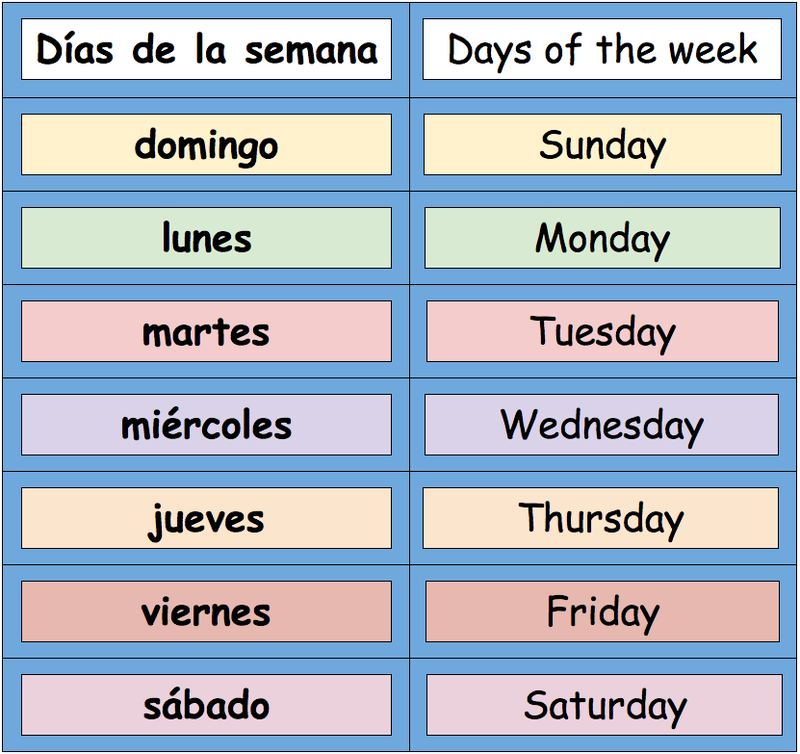 Wonder why the days of the week in Spanish have the names that they do? The word for Monday - lunes - means the same as in English: moon day. (The word for moon in Spanish is luna). The days Tuesday through Friday are named after Roman gods, which you'll recognize as names of planets. See if you can guess which day of the week is named after each one: Mars, Mercury, Jupiter and Venus. (Answers: martes, miércoles, jueves, viernes.) Saturday - sábado - is named after the word for sabbath, and Sunday - domingo - comes from the Latin word for God - Domini (Diós in Spanish). Watch the instructional video and repeat after el profesor. In this lesson you'll also learn the months of the year. 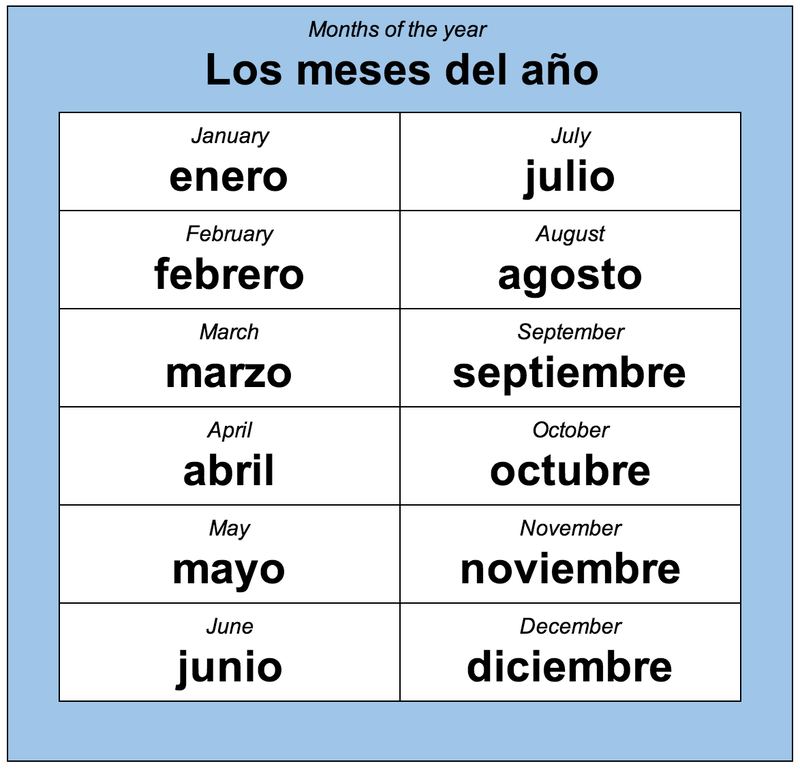 You'll notice that 11 out of 12 months look similar in Spanish and in English, the one exception being January, enero. Notice also that months of the year aren't capitalized in Spanish, same as the days of the week. How did the months get their names? The words for September, October, November, December look a lot like the Spanish words for seventh through tenth (séptimo, octavo, noveno, décimo). That's because our calendar has its roots in the Roman calendar, which early on had only 10 months. January and February were added later. What if you don't remember the day or the date, and you need to know? What's today's date? ¿Cuál es la fecha (de hoy)? It's May 1st. Es el primero de mayo. It's June 2nd. Es el dos de junio. It's July 3rd. Es el tres de julio. Ask for the fecha and you'll get today's date. Use el primero for the first of any month. Use just the # for any other day of the month. Ask for the día and you'll get the day of the week. Watch the instructional video on the months of the year. Sing along with the practice video. E: Buenos días, Señor Astronauta. R: Buenos días, Señora Extraterrestre. R: Muy bien, gracias. ¿Y usted? R: ¿Cuál es la fecha de hoy? E: Es el 15 de marzo. R: ¿Qué día es hoy? E: Good morning, Mr. Astronaut. R: Good morning, Ms. Alien. R: Very well, thank you. And you? R: What's the day of the week?